The UN Human Rights head is now in Sri Lanka and visiting the country’s North to see for herself the developments since the fall of the LTTE. Much prominence has been given to her meeting with a Mahaveer widow. Leaving aside that her ‘missing’ husband is a former LTTE senior leader and thus no saint we would like to know on the assumption of Ms. Pillay’s claim to be ‘neutral’ why she has not decided to first visit the real victims and their families who were the civilians that LTTE targeted and killed by planting bombs, claymore mines, indiscriminate shooting and sending suicide bombers? Should they not be getting more prominence given that they were the real victims targeted and eliminated to prop up LTTE’s terror image? 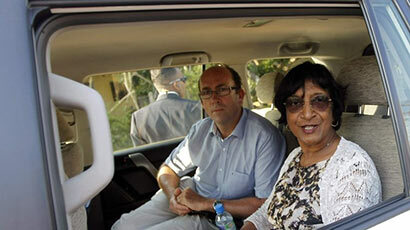 Yet, Ms. Pillay chose to meet Ananthy Sasitharan wife of a ‘missing’ senior LTTE leader Sinnathurai Sasitharan (Ezhilan). So Ms. Pillay had time to listen to the widow of a former LTTE leader who incidentally also happens to be contesting the Northern Provincial Council elections from the Jaffna district on the LTTE appointed political party the TNA ticket – this does not give much credibility to either the TNA or the spouse of the ‘missing’ LTTE. Thus, the widow of the former LTTE is now a politician and therefore we question why Ms. Pillay chose to meet up a politician LTTE than actual victims. Being a politician disqualifies her from making representations as a member of civil society – surely Ms. Pillays office should have known this simple protocol? Is it not interesting that it was Fr. Emmanuel Sebamalai, a Catholic Priest from Mannar who set up the meeting with Ms. Pillay. Ms. Pillay should have taken the opportunity to ask her how many Tamils and non-Tamils would have gone ‘missing’ during the LTTE heyday and what about the 5000 armed forces and police personnel abducted and remain unaccounted for? This is no small number and Ms. Pillay or her Human Rights office cannot ignore this number. If the wife of a LTTE leader can complain and Ms. Pillay has time to listen to her, should Ms. Pillay not be meeting up with the wives of the 5000 service personnel still missing? Far before meeting any wives of terrorists, Ms. Pillay should have met the scores of people who are now blind because the LTTE bombed Sri Lanka’s Central Bank, the families of dead children cut to pieces, the mothers of children who died while traveling to school when LTTE bombed the bus they were travelling in. These are the victims because LTTE chose to use them as pawns simply to put their name on the international press board and for Governments to notice their terror activities. So we ask again WHY IS MS PILLAY NOT MEETING WITH THESE VICTIMS FIRST? Why has she got no empathy for these civilians and only opting for ‘civilians’ she sees fit to meet? While continuing to stress that Ms. Pillay’s emotional, genetic and ethnic ties being a Tamil herself disqualifies her from engaging in any neutral fact finding in Sri Lanka, this was proven in the manner Ms. Pillay was seen commenting on land issues which is totally irrelevant and outside her mandate. This speaks volumes about the conflict of interest in her role in investigating Sri Lanka and it surprises us that the UN Ethics Office has yet to explore this conflict of interest. However, given that there are calls made by pro-LTTE lobbies to reduce the military and claims of illegal land occupation, the argument merits us to refer records by Government officials in Vavuniya, Kilinochchi and Mulllaitivu districts of complains by people returning to Sri Lanka after 25 years to find their lands illegally occupied – these lands had been taken over by LTTE and distributed amongst Mahaveer families during the 2002 ceasefire agreement by the UNF Government who had given these LTTE mahaveer families official title deeds. These allegations warrant investigation of UNF officials and officials of the Land Registry if any wrong doing has taken place. No one has any right to be destroying original deeds and writing new deeds whether it is for LTTE Mahaveer families or not. Much of the current problems stem from the fact that these Mahaveer families are now refusing to leave the lands they are falsely making claim over and the conflicts have arisen again due to prominent caste factors which many Tamils take pains to hide but Ms. Pillay being a Tamil herself will only know too well how caste system works and how caste system has again come to the surface following the fall of the LTTE. However, what Ms. Pillay is guilty of is that she is picking and choosing who she defines as a ‘victim’ who she claims is a ‘civilian’ and who she meets. Top on any list of civilians and if she is meeting victims she should first be meeting up with the families of civilians that LTTE eliminated and the survivors who are either blind or carrying some other injury for no fault of theirs. While we do empathize with the civilians caught up in the conflict areas we cannot rule out that some of them voluntarily or by force took part in some sort of terrorist activity that the LTTE ordered them to do. This is amply recorded in UN statements where even the UN Secretary General is on record for saying that civilians were forced to take part in combat operations – this clearly denies them refuge as a non-combatant. What we would like to question Ms. Pillay about is why she has not taken any efforts to meet up with the widows and families of the 5000 armed forces and police personnel who are still missing for this is something she is mandated to investigate and she should be questioning the LTTE front organizations as well as the Tamil National Alliance to their whereabouts. She should also have met up with the families of the victims who were targeted by the LTTE and who died which included women, pregnant women, children, babies, student monks, villagers, farmers, the elderly, feeble and scores of others. Where are Ms. Pillay’s time slots for them? Let’s wait for her report to see how biased it is in favour of the Tamils. We can then call for her sacking from her position as the Commissioner for Human Rights. She is an ethnic Tamil herself, although an Indian Tamil from S. Africa. She will be biased in favour of Tamils wherever they are. It is amazing how she had ignored to meet families who had lost their dear ones due to LTTE terrorism. Captured Sinhala soldiers were treated brutally by the LTTE, even to the extent of keeping them alive in horrible conditions to get blood for injured LTTE cadres and for organ harvesting. LTTE committed gross war crimes. Ms Pillay had totally ignored to gather evidence of this. Why has she not subjected Blair and Bush also for interrogation for their war crimes and had them arrested and tried before the International War Crimes Court? She would not dare do it as she would not only lose her job but also her life through the CIA. It is easier to go after small fry on the diktats of her masters, the imperial West. You are a pillar of morality and you support us in the long and tedious drive towards true Budhistic reconcilliation. Nicholas, you are well ahead of Ven Galgoda Athhe Gnanasara Thera and Ven Ven Iththalkande Sadhatissa Thera who are leading the moral resurgence of our Sinhala Buddhist Nation. Nicholas, when you don’t manifest in the Onlanak blog, I have a sleepless night fearing the worst. In fact, a couple of weeks ago, I dreamt of Shenali walking in tears behind your coffin in the long walk in Kanatte. Nicholas, don’t stay away for too long from Onlanka; we need you here, in these trying times, every day, every minute to guide us in the true path of Buddhist reconcilliation. Nicholas, our Nation is one where Budhhism reigns supreme and all other languages and religions are second rate belonging to the coolies. We need you Nicholas.